Video how this automatic e-pill dispenser works. 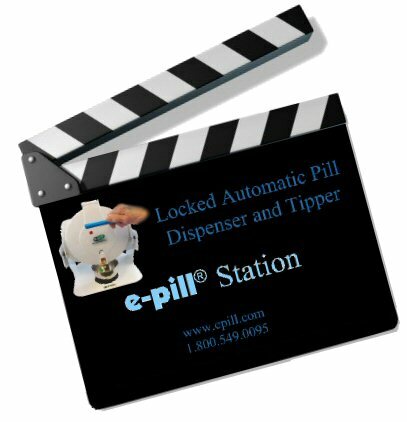 The e-pill STATION is a locked Automatic Pill Dispenser with Tipper for Home or Institutional use. See if an e-pill automatic pill dispenser is right for your loved one. 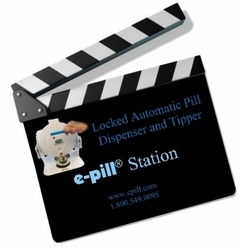 The e-pill Station Automatic Pill Dispenser dispenses pills into a medicine cup. Never forget or double dose again! Auto dispense up to 6 times per day with the e-pill MedTime STATION. An e-pill machine is THE ANSWER for anyone with a COMPLICATED DISPENSING SCHEDULE or requiring LOCKED access to medications. Automatic Pill Dispenser video: Improve medication adherence and patient compliance with this popular e-pill Medication Reminder. The e-pill MedTime STATION pill dispenser / pill organizer is easy to use and allows an aging parent to continue to live independently at home, or "Age in Place".